Our end to end service specturm, covering a wide range of Microsoft Technologies, provides effectual tools to uplift your business. 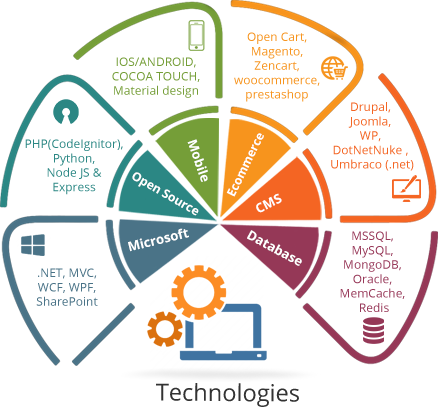 Our dynamic open source and CMS solutions are tailored to help you leverage your business value, facilitating rapid growth. Our mobile application solutions incorporate the latest technologies, and are designed with a keen focus on user experience while addressing challenging business problems. Our customizable, end-to-end eCommerce solutions adhere to your business strategies while enchancing productivity and helping you stand out from the competition. CMMI is a capability improvement framework that provides organisations with the essential elements of effective processes that ultimately improve their performance. An appraisal at maturity level 3 indicates the organisation is performing at a “defined” level. At this level, processes are well characterised and understood, and are described in standards, procedures, tools, and methods. The organisation’s set of standard processes, which is the basis for maturity level 3, is established and improved over time. About CMMI® Institute CMMI Institute (CMMIInstitute.com) is the global leader in the advancement of best practices in people, process, and technology. The Institute provides the tools and support for organisations to benchmark their capabilities and build maturity by comparing their operations to best practices and identifying performance gaps. For over 25 years, thousands of high-performing organisations in a variety of industries, including aerospace, finance, health services, software, defence, transportation, and telecommunications, have earned a CMMI maturity level rating and proved they are capable business partners and suppliers. To learn more about how CMMI can help your organisation elevate performance, visit CMMIinstitute.com.